Nam Song river at Vang Vieng, a small town four hours’ bus journey (150 km) north of the Laotian capital, Vientiane. The Nam Song flows through karst country, noted for its striking limestone rock formations. As a result, in the 2000s it became a major destination for backpacking tourists, who would hire tractor inner tubes and float down the river to enjoy the scenery. This tourist trade reached its heights in the early 2010s, by which time several bars had sprung up on the riverbanks in and around the town of Vang Vieng, offering beer and other mind-altering substances. Unsurprisingly there were casualties, including several tourist deaths (reportedly 27 in 2011 alone). A crackdown by the Laotian authorities in 2012 removed the riverbank bars and provided some regulation of the “tubing” trade. 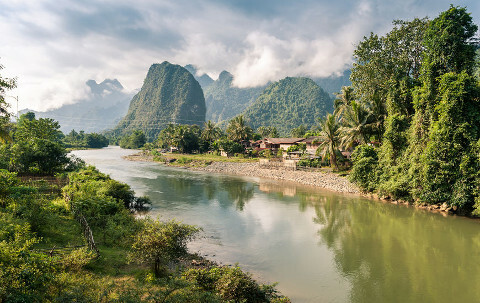 This entry was posted	on Saturday 26 January 2019 at 12:43	and is filed under 2019, British Expat Latest, Laos. You can follow any responses to this entry through the RSS 2.0 feed. You can leave a response, or trackback from your own site.